Click the icon below to download the app to your smartphone. You can also search CTV Barrie Cottage Traffic Alert in your favourite app store. Even while you’re recording your first trip, the system will advise you of any traffic troubles up to 20 kilometres ahead, with voice and visual alerts. The application will passively and anonymously send your location periodically to our server. Depending on the speed that you are driving on the road, we will know if you are driving ‘smoothly’ with no traffic, or if you are in a congested area. This information will then be used for other users behind you – advising them of the traffic conditions ahead. tip. Just press the “Call to Report” button on your iPhone or Android phone, or the space bar in the map view on your BlackBerry. You will then be connected to our traffic centre where you can provide us with real-time updates on the road conditions. This way, all of our users will not only know the traffic may be slow ahead, but will also find out why. Get a head start on your weekend with the Winter Watch Report directly from your App. Watch video of news stories about cottage country. Ontario Tourism’s Jack Lynch gives you a rundown of area events. The Winter Watch Report has your weekend weather, marine report, campsite vacancies, traffic camera’s and breaking news and extreme weather alerts. Just press “News” on the map screen of your iPhone or Android. Click above for answers to frequently asked questions about the app. 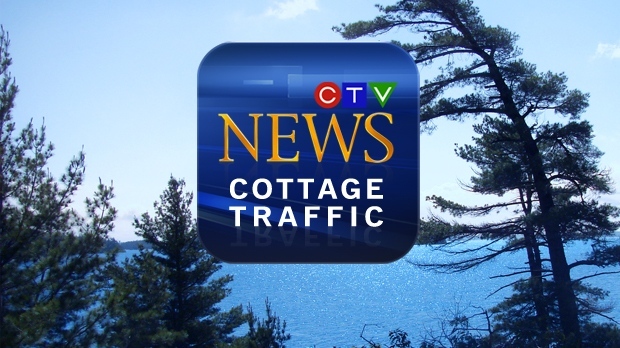 If your question isn't answered, email us at cottagetraffic@ctv.ca.